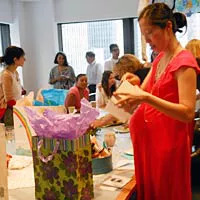 The staffers here at Health threw our lovely executive deputy editor Jeannie Kim a baby shower (she has since had her son Gus! Congrats Jeannie!). The theme was “afternoon tea” so we thought--what better time than to do a teakettle test? What we were looking for: teakettles that would work fast (we were shipping the magazine, so didn’t have hours to wait around for the water to boil), as well as those that had any interesting features. The staffers here at Health threw our lovely executive deputy editor Jeannie Kim a baby shower (she has since had her son Gus! Congrats Jeannie!). The theme was âafternoon teaâ so we thought--what better time than to do a teakettle test? What we were looking for: teakettles that would work fast (we were shipping the magazine, so didnât have hours to wait around for the water to boil), as well as those that had any interesting features. This is one tricked-out kettle. 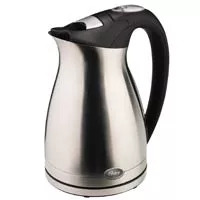 Not only did it heat up the water in a snap (with its "1500W rapid boil" technology), but I loved the safety aspect â a ready bell dings when the water is done boiling, then it automatically shuts off. 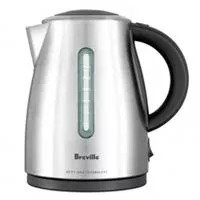 While not loaded with as many features as the sleek Breville kettle, this one still automatically shuts-off (although there's no bell reminder), and comes in at $20 less. Not too shabby!